This review is of the cut shown at the BFI London Film Festival in October 2017 – the UK release date is currently listed for November 10th 2017. 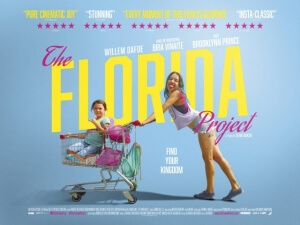 The state of Florida is a tourist attraction in and of itself, not least because it includes some of the most popular theme parks in America as well as some of the most attractive summer weather (most of the time, anyway), and as we see in Sean Baker’s new film The Florida Project the place looks and feels just as tacky and artificial as anything you’d find in an amusement park. But that’s entirely the point: Baker creates a landscape burdened by a deflating economy and a whole cast of lowlifes, all within something painted and designed to appeal to the most naïve of outside visitors, like a tourist trap that lets you see the cracks in its artificial surface. And yet, he has also made something that’s not completely cynical or bitter, but rather a film that adopts a much more innocent and fun-fuelled perspective to give it a sense of imagination and wonder that only a child could conjure up. That child, the central character of the film, is six-year-old Moonee (Brooklynn Kimberly Prince) who spends her days running about the promenade of motels just down the road from Walt Disney World, causing mischief with her young friends and generally annoying the adult guests. She lives at a motel herself, with her young and irresponsible mother Halley (Bria Vinaite), and under the watchful eye of the motel manager Bobby (Willem Dafoe) whom she constantly frustrates with her and her mother’s out of control behaviour. It’s not a heavily plot-based narrative, and it is mostly made up of vignettes that show young Moonee going about her day, interacting with other guests, her friends, Bobby or going out with her mother to swindle tourists out of their money to help them pay the rent. However, for a film like this, one that’s meant to give us a glimpse into a whole different kind of life than we’re used to seeing in all the promotional videos from the Florida tourist board, it’s completely within reason for it not to adopt a full-blown three-act structure. It does a fine job at showing the rather ugly side of living an impoverished life in the biggest tourist state in the country, from the vile behaviour that some of the guests inflict upon one another, to being able to wander about the most derelict of areas including an abandoned set of houses without so much in the way of parental guidance. Baker makes it feel natural as well as uncomfortably real, shooting on 35mm film to ground it amongst the brightly-painted buildings and tackily-designed local stores (an orange juice hut is designed in the shape of an actual orange, a giant wizard is situation on top of a gift shop and so on), and having his actors – especially the younger forces of nature like Prince – find the humanity as well as the carefree warmth in some of their very real performances. But despite the depressing contexts of poverty and lower-class living situations, it is still a film that harbours a wide-eyed and energetic attitude, particularly when it focuses on Moonee and her friends just being the mischievous kids that they are, which luckily takes up a lot of the film. Whenever they’re taunting other motel guests, it’s usually out of childhood innocence and just a case of kids being kids, instead of a genuine nastiness on their part. Though in Moonee’s case, her sassy influences come from her own mother who herself is an overgrown child, prone to throwing tantrums of her own and acting completely irresponsibly when it comes to looking after her young daughter. Their relationship is much more like a sibling one instead of paternal, and we see that it both benefits and works against the little girl’s upbringing, leading to a final scene that truly embraces the child-like sense of wonder and imagination, in a sequence shot on iPhone technology – similar to Baker’s last feature Tangerine – which is bound to divide audiences for its abrupt stylistic change and even more abrupt conclusion, but perfectly symbolises the innocent desire for a world much greater and fantastical than the one they’re forced to live in. It won’t win everyone over, but The Florida Project is both a sweet and sour vision of the home to the happiest place on Earth. The Florida Project is a bittersweet portrayal of impoverished life in the country’s biggest tourist state, one that adopts a wide-eyed and adventurous child’s perspective on the seedier world around them.